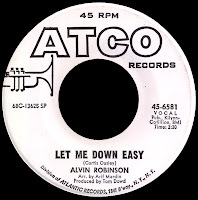 I've been thinking a lot about Alvin Robinson lately. Yeah, I know I've written about him before, as have Dan Phillips and Larry Grogan, but I still don't think he's appreciated enough. He never made an album, and only managed to dent the charts once, but I still consider him to be one of the great voices of R&B. I was introduced to his music by the infamous 'tape', and have been hunting for it ever since. When I found this amazing B side you're listening to now on eBay recently (after about twenty years of digging), I knew I had to share it with you. 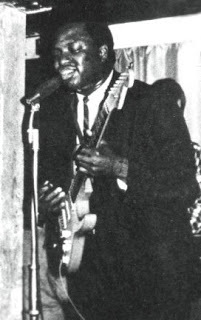 Just an awesome song, it was released in 1961 and written by George Davis, the fabled New Orleans session guitarist who would go on to play that smokin' guitar on Robert Parker's Barefootin'. 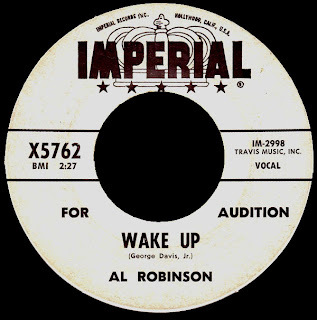 Although it doesn't say so on the label, I'm guessing that the horns were arranged by Wardell Quezergue, as he was working with Dave Bartholomew at Imperial at the time (as we've seen on soul detective). 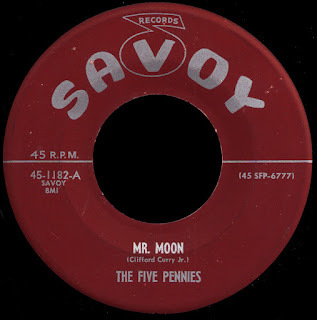 This early sixties period at the label is often overlooked as it comes after Fats Domino's biggest hits, and is concurrent with the blockbusters that Allen Toussaint was churning out for what was soon to become an Imperial subsidiary, Minit. As the executive producer, Bartholomew was still making great records, even if they weren't selling the way they used to... today's selection being a case in point. His first single, 'I'm Leaving You Today' (Imperial 5727) kind of sets the tone for much of what was to follow, as his vocal similarities to Ray Charles (who was simply THE MAN in those days) tempted the record companies to jump up on the bandwagon. What sets this one apart, however, is the incredible Smokey Johnson drum work.... wild! 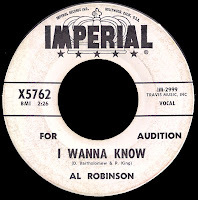 'I Wanna Know' (the A side of today's selection) is another Charles styled number written by Bartholomew and Pearl King (with whom he had composed some of Smiley Lewis' biggest hits like I Hear You Knocking and One Night) as was his last single for the company in 1962, 'Oh Red'. 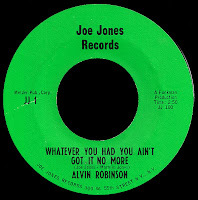 In 1963, Robinson (now using his full first name, Alvin) hooked up with the inimitable Joe Jones, who had parlayed his one and only hit record (You Talk Too Much) into a career as a music business mover & shaker. As he told John Broven in 1975: "..I went to New York with my tape recorder. I went to two boys called Leiber and Stoller and they flipped... this was 1964 coming in, and I went down there and got The Dixie Cups, the Five Blue Jays, my entire band. James Black came with me - Smokey Johnson dropped out at the last moment. Then I had Shine... We did Chapel Of Love, Something You Got, we had three hits at one time... I did all the promotion. I was the producer, manager, the booking agent. I did all that." Yes he did all that, sending Chapel Of Love straight to #1 Pop (there was no Billboard R&B chart in 1964!) where it would sit for three weeks, followed by Robinson's totally untouchable version of Chris Kenner's Something You Got which would spend two months in the Hot 100 that summer, making it as high as #52. One of the most New Orleans sounding, Popeye-ish records out there, it was indeed cut in New York with AFO graduate Melvin Lastie leading the horn section for Jones. The flip, a (no doubt obligatory) cover of Lieber and Stoller's Searchin', cooks right along as well. 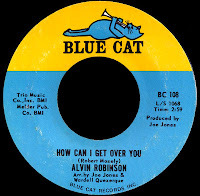 I'm not exactly sure where this one fits in chronologically, but since it's an obvious 'answer record' to Alvin's big hit, I figured I'd put it up next. 'Whatever You Had You Ain't Got No More' uses pretty much the same horn lines, and is the only release I've ever seen on Joe's own label. The flip, 'You Brought My Heart Right Down To My Knees' is another Crescent City workout, with James Black on the drums and The Dixie Cups handling the background vocals. Robinson's really belting it out on this one! 1964 was also the year that Jerry Lieber and Mike Stoller opened up their Red Bird label with George Goldner. 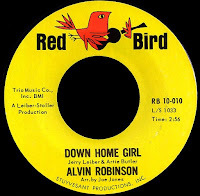 It remains best known for 'girl group' material by The Dixie Cups and The Shangri-Las, but it was also home to what I consider to be Alvin's best record, Down Home Girl. A Joe Jones arrangement of a Lieber and Butler song, this is just about as good as it gets... every time you move like that, I have to go to Sunday Mass." Word. Backed with a killer Mike Stoller arrangement of our man Little Willie John's Fever, this 45 is simply a must have. 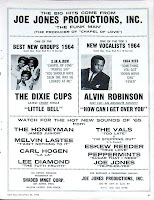 Later that same year, Jerry and Mike formed yet another label, Blue Cat, which was apparently seen as their R&B outlet, and so was the imprint for Robinson's next two singles in 1965. His cover of Raymond Lewis' I'm Gonna Put Some Hurt On You outdoes the original, and is one of the best New Orleans records you're likely to find. It was produced by Jones and, interestingly, How Can I Get Over You, the Ray Charles styled number on the flip, credits old friend Wardell Quezerque as an arranger. According to Larry Grogan, his next Blue Cat single was recorded down in Sugar Town, and Robinson's searing guitar work on Let The Good Times Roll (actually a cover of Earl King's Come On) has to be heard to be believed. 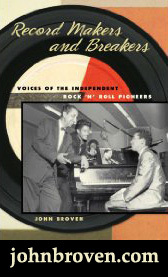 Quezergue is also listed as a co-writer of the B side, the northern soulish Bottom Of My Soul. By 1966, both Red Bird and Blue Cat were history, and Robinson was on his own. By 1969, Alvin was indeed out in Los Angeles with Battiste and the rest of his expatriate New Orleans task force, doing session work whenever and wherever they could find it. Harold had some kind of deal with Mercury to release some stuff on their Pulsar subsidiary and, together with Mac Rebennack, formed HalMac productions. 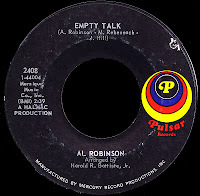 Empty Talk, co-written by Mac, his running partner Jessie Hill and Robinson himself, is one of those Brother Ray type Blues numbers that didn't sell much despite the sterling Harold Battiste arrangement. The absolutely amazing flip (which was one of our first posts here way back in October of 2005), Sho 'Bout To Drive Me Wild, remains one of my all-time favorite records. There was apparently one more release on Pulsar, which was credited merely to 'Shine' (which is what everybody called him). I have yet to find a copy. Whatever. He is one of the coolest, most under-rated guitar players and vocalists of all time. Hope you dig the podcast. 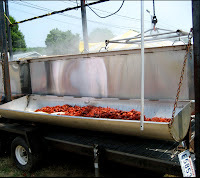 Now, I'm off to the nineteenth annual Crawfish Fest out in the wilds of New Jersey this weekend. This year's festival hosts Allen Toussaint, Art Neville and George Porter's Funky Meters, The Radiators, Bonearama, The Lee Boys, Little Freddie King and many more. Come on out and hang with us, there's gonna be a party goin' on! It seems you've done quite a bit of research on Alvin. I've never heard of the guy before but that track you posted was amazing. Have you ever considered contacting Ace/Kent records if they would like to produce a CD on him? 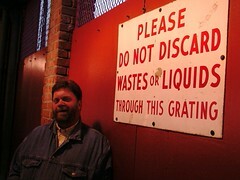 It sounds like the kind of material that could get Tony Rounce plenty exited. Thanks for putting all these tracks in one spot. I only knew "Down Home Girl," which I got years ago on some LP compilation of NOLA soul. I agree with soulboogiealex that this selection would form an absolutely fantastic compilation package, pretty much as-is. 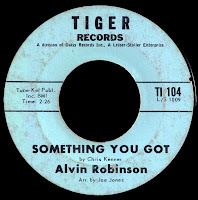 If you like Alvin Robinson - and who wouldn't? - you'll also like Lee Moses, whose only album "Time And Place" has been given an extended reissue treatment that I believe contains all his released tracks. Moses was a very talented singer & guitarist who, like AR, just reaches way down and GETS it. Wow. Excellent post Red. I am really enjoying these podcasts. Great work. Thanks! Nothing remains unreleased forever. One day it will all go out of copyright, and then we will see a flood of repackages as we do mow on early jazz and blues stuff from the 1920s and 30s. A new one on me. Appreciate the enlightenment. Down Home Girl is a great tune. Those are some obscure tracks and labels. Nice digging. I snagged the tracks from iTunes, but wish there was more available. Thanks for the scholarly research and sharing. Nice job Red. I agree that Alvin was one of the great overlooked artists of his time. 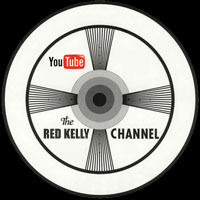 Mr. Red Kelly, some of the songs you have posted here bring back so many fond memories of my dad. You have some tunes here that I had not heard in awhile, like Sho' Bout to Drive Me Wild. I can remember as a very young girl singing that song around the house and am happy to have run across this recording on your blog site. I've been attempting to create a scrapbook on my dad and plan to use and include much of the information you have gathered. I'm happy to hear that many people, even those who have never heard him or of him until recently, enjoy and appreciate the music he left behind. I've been fascinated reading this. Saw Shine onstage backing Irma Thomas in London sometime in the 1980s but alas he did not get a solo spot. Just a little titbit of info: against all the odds, the Joe Jones label 45 came out in Britain, on Miki Dallon's indie label Strike Records (JH 307) in 1966. I heard that song first when you post it ... It's still on my Mp3 player and I love it !